The problem is that they do not mean by this what the Bible means. Rome’s doctrine of salvation is not the the true gospel of complete and sure salvation through personal faith in Christ. It is a gospel of works that is sometimes presented under the guise of grace. Rome’s gospel centers in the Catholic Church, the pope, the priesthood, and the sacraments. While Catholicism teaches that Christ died on the cross to purchase man’s salvation, it is not satisfied simply to invite men to receive this salvation by faith directly from the resurrected Christ. “For ‘God’s only-begotten Son ... has won a treasure for the militant Church ... he has entrusted it to blessed Peter, the key-bearer of heaven, and to his successors who are Christ’s vicars on earth, SO THAT THEY MAY DISTRIBUTE IT TO THE FAITHFUL FOR THEIR SALVATION. They may apply it with mercy for reasonable causes to all who have repented for and have confessed their sins. At times they may remit completely, and at other times only partially, the temporal punishment due to sin in a general as well as in special ways (insofar as they judge it to be fitting in the sight of the Lord). The merits of the Blessed Mother of God and of all the elect ... are known to add further to this treasury’” (ellipsis are in the original) (Vatican II Council, Constitution on the Sacred Liturgy, Apostolic Constitution on the Revision of Indulgences, Chap. 4, 7, p. 80). “For it is through Christ’s Catholic Church alone, which is the universal help towards salvation, that the fulness of the means of salvation can be obtained. It was to the apostolic college alone of which Peter is the head, that we believe that our Lord entrusted all the blessings of the New Covenant, in order to establish on earth the one Body of Christ into which all those should be fully incorporated who belong in any way to the people of God” (Vatican II Council, Decree on Ecumenism, chap. 1, 3, p. 415). “Just as Christ was sent by the Father so also he sent the apostles ... that they might preach the Gospel to every creature and proclaim that the Son of God by his death and resurrection had freed us from the power of Satan and from death, and brought us into the Kingdom of his Father. 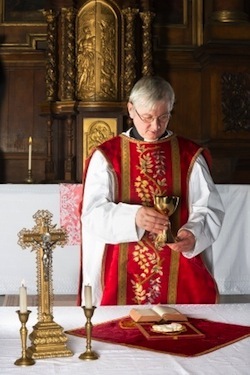 But he also willed that the work of salvation which they preached SHOULD BE SET IN TRAIN THROUGH THE SACRIFICE AND SACRAMENTS, around which the entire liturgical [ritualistic] life revolves” (Vatican II, Constitution on the Sacred Liturgy, Chap. 1, I, 5,6, pp. 23-24). “THE SEVEN SACRAMENTS ARE THE NECESSARY MEANS ESTABLISHED BY CHRIST THROUGH WHICH HIS REDEEMING, LIFE-GIVING, SANCTIFYING GRACE IS IMPARTED TO INDIVIDUALS’ SOULS. You must centre your life upon the sacraments established by Christ if you want to save your soul. means of salvation. ... The sacraments are the source of your real life, the divine life that will unite you with God in this world and in eternity. Let nothing make you think that you can get along without the sacraments. Without them your soul must die. ... IF YOU DON’T RECEIVE THE SACRAMENTS AT ALL, YOU DON’T RECEIVE GRACE. If you don’t receive them properly, that is, if you receive them seldom and with little devotion, you receive less grace” (L.G. Lovasik, The Eucharist in Catholic Life, pp. 14,15). 1. When were you converted? 2. How were you converted? 3. To what, or to whom, were you converted? 4. What do you believe now that you did not believe before your conversion? 5. What does it mean to be saved? 6. On what scriptural promises do you base your salvation? 7. What does it mean to be born again? 8. Are you sure today that if you die tomorrow, or at any time in the future, you will be in heaven immediately after death? 9. What do you believe about Purgatory? 10. What do you believe about the Mass? 11. Do you still participate in the Mass? 12. Do you believe that any sinner can be saved who dies without trusting in Jesus Christ alone for the salvation of his soul and forgiveness of his sins? 13. Do you believe that Mary and Roman Catholic saints can answer your prayers or help you get to heaven? 14. How do you believe that the blood sacrifice of Jesus Christ is applied to your soul? 15. Have you told your priest you have been saved? 16. Do you believe you will still go to heaven if you leave the Roman Catholic Church, receive believer’s baptism and join a fundamentalist Bible believing, non-Catholic church? 17. When and where do you plan to do this? As questions such as these are discussed in detail, it will become evident that the person is trusting in his works, merits, baptism, confirmation, sacraments, or something BESIDES OR PLUS, Jesus Christ, and not in Christ and Christ ALONE. He can then be shown the difference between his unbiblical form of salvation and the saving faith of the Bible.